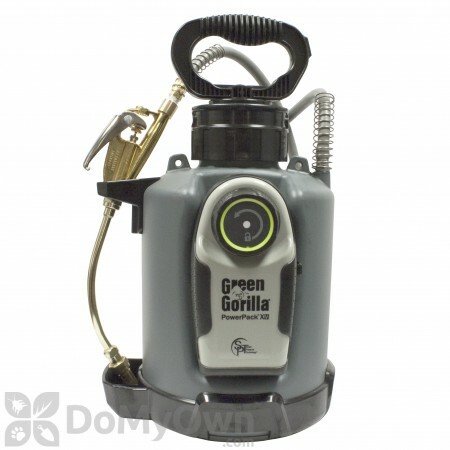 The Green Gorilla ProLine Vi Pro System uses Smart Pressure Technology (SPTTM) packaged in a detachable, rechargeable, lithium ion power pack which electronically pressurizes and maintains the air pressure in the tank. Due to the latest power density technology, the lithium ion power cells are maximized when air is pressurized in the tank. This leads to a full day of spraying with just one charge! SPTTM provides the optimum pressure for even distribution of pest control products - no more pumping and guessing if the pressure is correct. SPT allows for precision delivery of chemicals and a reduction in spray time which means the system will pay for itself after only a few jobs. There is a 25% savings in time, resulting in a 20 hour savings over a 4 week period. Typically it takes around 80 hours for 4 weeks of spraying with a conventional sprayer while the Green Gorilla only takes 60 hours! The Power Pack is easy-to-use, just attach it to the tank with just a push and a click, turn it on and it automatically starts working. To remove, just rotate the knob while the tank is still under pressure. Feel free to swap the Power Pack and attach to other Green Gorilla tanks for faster productivity time. The base of the tank is also seamless - perfect for easy cleaning! Green Gorilla tanks are highly durable - drop it from six feet high onto concrete and it does not break! It is more durable than metal. Green Gorilla sprayer systems will make your job easier, allowing more attention on the job service - saving you time and money. Includes a chemical resistant high strength, high density polymer tank, backup hand pump, Power Pack X with SPT, and an adjustable pin to cone nozzle attached to the tip of a brass wand. This is a popular choice and has a shut off handle. Choose 1.5 gallon tank with 8 inch wand, 1.5 gallon tank with 18 inch wand or 2.5 gallon tank with 18 inch wand. Green Gorilla ProLine Vi Pro System 2.5 Gal. tank measures 22 inches H x 10 inches width at the bottom of the sprayer. If interested in an option without an extension - The Green Gorilla ProLine Vi Foundation System can be found here. Perfect for use with your preferred B&G extension. IMPORTANT: When putting the battery pack on the tank, DO NOT turn the dial to the right to lock it. Doing so will cause it to break. It just clicks on and it is locked when you attach it to the tank. When taking it off of the tank, just turn it to the left to unlock the battery pack. Includes Power Pack X and 1.5 gallon OR 2.5 gallon sprayer tank, with 48' hose and 8 inch OR 18 inch brass spray wand with adjustable spray nozzle. AC wall charger included. Material: Space- age high strength Xenoy - 6 foot drop test onto concrete and it does not break! Connection to Tank: Push in to attach, twist knob to remove. I own a pest control company. I Immediately changed wand to a B&G 24in wand. Worked as advertised for about a week. Then the bottom screw on the side where you connect battery started leaking. So far I have had no luck stopping the leak. It prevents it from building pressure. Emailed manufacturer and have gotten no response. Its a WASTE of money. Stay away from it. I have not contacted do my own because they have not backed up there products before when they have sent me the wrong chemical. So it is an expensive paperweight now. Good afternoon, We are sorry to hear that you are having an issue with this sprayer. It looks like our team has already reached out to you and sent you a pre-paid return shipping label to return the product for a full refund. We also see that we reshipped you all new product when you thought you had a problem in one of your past orders two years ago (the color of the product label had changed, the product had not). Please let us know what other action you would like us to take to make you a satisfied customer. I have been in pest control for 39 years. Trying out the Green Gorilla. Battery stays up good. A little noisy with the pump. Lot of customers say "whats that noise". Didnt care for the wand. Drips after letting go of the handle. Switched it out from my B&G ban drip. A bit heavy. Pretty good quality. Had it a couple weeks now. Time will tell. 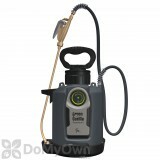 Just received my sprayer, one thing, after pressure builds up when you pull the trigger and release it, it leaks. I just went ahead and took one of of my long 18 inch B & G's no drips works perfectly thanks. What is the weight and is Green Gorilla ProLine Vi Pro System back pack? What does this sprayer weigh before liquid is added? Also, can this be made into a backpack? It would be easier/less strenuous to carry on the back vs in the hand when large areas are needed to be sprayed. Green Gorilla ProLine Vi Pro System weighs approx. 8 pounds without liquid. If requested can be converted into a backpack. Has the wand been upgraded on the Green Gorilla ProLine Vi Pro System? Some of the reviews are complaints about the wand dripping, but in the picture of the pro model with the 18" wand it looks identical to the B&G Extenda-ban wand. Are the complaints of dripping coming from those who have purchased the older model with the straight wand? Or is the 18" look-a-like wand a cheap knock-off of the B&G? We apologize but are not aware of any changes in the wand for the Green Gorilla ProLine Vi Pro System. B&G wands are interchangeable with the Green Gorilla but are not included with the unit. 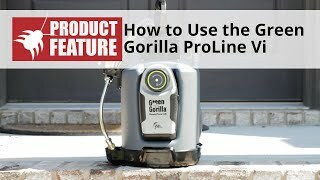 Does the Green Gorilla ProLine Vi Pro System have a warranty? 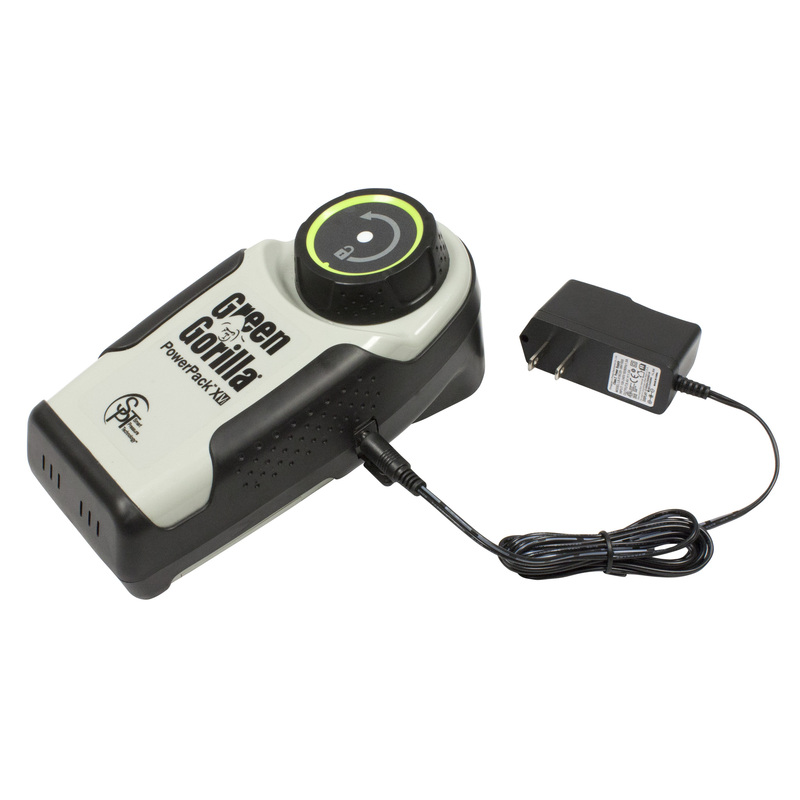 The Green Gorilla ProLine Vi Pro System does come with a 1 year manufacturer's warranty. 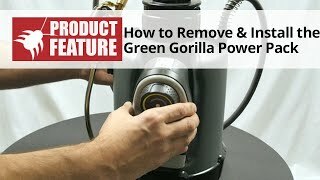 Is the Green Gorilla ProLine Vi Pro System rebuildable? This is an expensive unit, is it rebuild-able like a B&G? Also, can anyone who's not trying to sell me this thing confirm there's a 6-8 hour run time? How many times are these batteries able to be recharged before they're fried? Yes, the wand for the Green Gorilla ProLine Vi Pro System is rebuildable. These are new units, and you can speak directly with the manufacturer for any additional questions regarding the battery life and run time. Their phone number is 412-443-2094. How much does the Green Gorilla ProLine Vi Pro System weigh? Do both the 1.5 gallon and 2.5 gallon sprayers weigh 8 pounds? Is it possible to convert this sprayer to be used as a backpack? The 1.5 gallon Green Gorilla ProLine Vi Pro System weighs approximately 8 pounds. The 2.5 gallon Green Gorilla ProLine Vi Pro System weighs approximately 8.20 pounds. The sprayers currently do not have a way to convert to being used as a backpack.